In 2002, Dr. Jane Goodall presented Amma with the Gandhi-King Award for Non-violence, given in recognition of her lifelong work in furthering the principles of non-violence. During the same event, at the UN headquarters in Geneva, She gave the keynote address at the Global Peace Initiative of Women and Religious Leaders. 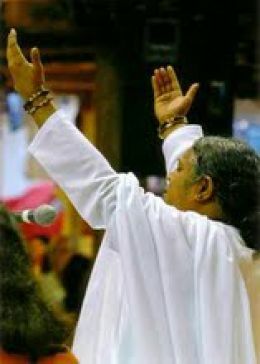 I’ve been attending Amma’s public programs in the United States every year since 1990.